Princess Marie Auguste was three months short of her 18th birthday when she married Prince Joachim of Prussia, the youngest son of Kaiser Wilhelm II. It was a purely dynastic marriage as Marie was the niece of the reigning Duke of Anhalt, Friedrich II. Duke Friedrich and his wife, Marie of Baden, were childless, and the heir apparent was Marie's father, Eduard, who was married to Princess Luise of Saxe-Altenberg. The engagement between Princess Marie Auguste and Prince Joachim was announced on October 14, 1915. Joachim, 22, was a Captain in the Fourteenth Regiment of Hussars. The marriage took place at the chapel at Schloss Bellevue, near Berlin. The marriage, which was according to the rites of the Lutheran church, was witnessed by the German Empress, the Duke and Duchess of Anhalt, and other relatives. Kaiser Wilhelm II did not attend. Prince Joachim was serving with the German Army on the Russian front. In April 1915, the New York Times noted that Joachim "had narrowly escaped capture by the Russians." The bride's father, Prince Eduard, was also in the German Army, serving with the Crown Prince, Joachim's brother, in the Verdun area. At the time of her wedding, Marie Auguste was described as "one of the most beautiful of German princesses." It was said that Marie Auguste's romance "began after the outbreak of the war," when she met "the stalwart youngest son of the emperor on his way to the front." It was a "case of love at first sight," and although both families approved of the marriage, the wedding had to be postponed because of the war. One wonders how much of this was propaganda. 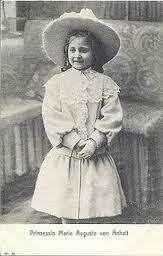 It seems more likely that young Marie Auguste, a mere child, was sacrificed at the marital altar. This latter view was offered by Countess Emilie Alsenborg, who served as one of Empress Auguste Viktoria's ladies-in-waiting. But after the outbreak of the first world war, Emilie was dismissed by the Kaiser, and she returned to to her native Sweden, where she wrote her memoirs. She described Joachim as "the spoiled child of his mother, and like most spoiled children has repaid indulgence with worry and disappointment. He was born prematurely, and was a "physical weakling, and subject to epileptic fits since his birth." Countess Emilie described Joachim as not strong, "either mentally or morally." Auguste Viktoria was the one who selected Marie Auguste for Joachim and was very keen for the marriage. Wilhelm II, too, approved of the marriage largely because Marie Auguste came with a considerable dowry. The Kaiserin lamented that Joachim "would not hear of Marie Auguste as a wife." She was disappointed, but she did not know that her youngest son was in love with another woman. Her name was Erna von Eberhardt, and she was the sister of Joachim's equerry, Franz von Weberhardt. Joachim's military duties were largely ornamental, and he never saw true action. Thus, he had a lot of time on his hands, and he gambled and racked up too many debts. He went to see Erna, whose father had recently given her beautiful jewels on the occasion of her 19th birthday. She wore the jewels, which had been in the family for several generations when she met Prince Joachim. As Joachim's debts piled up and the creditors sought payment, he tried to find ways to get money. He knew that the Kaiser would not help, so he returned to the Weberhardt's castle in Saxony, and persuaded the trusting Erna, to hand over her jewels "so that he might temporarily pledge them for the money he required." Joachim assured Erna that he would return the jewels, but instead, he hastened to Berlin, where he "sold the jewels outright for 20,000 pounds." This money was given to his creditors. Enter Count von Zeppelin, a good friend of the Duke of Anhalt, who went to the Kaiserin and said that he would tell the duke about Joachim's behavior. Auguste Viktoria was "deeply incensed," as she feared that her plan to marry Joachim to Marie Auguste was about to unravel, and he would be forced to marry young Erna. Zeppelin had another idea: if the Kaiserin could do her "utmost" to persuade her husband to give the order for the "Zeppelin raids over London," von Zeppelin would not tell the Duke of Anhalt about Joachim. Joachim was confronted by his mother about his "scandalous misconduct" and his theft was made known to Erna's family. Joachim "trembled and whimpered" as his mother "enlarged upon the wrath of the Kaiser." Prince Joachim had no choice but to hurry to Dessau to propose to Princess Marie Auguste. He returned to Potsdam a few days later as a "betrothed man." Her own childhood was largely unhappy, as she and her younger siblings witnessed the disintegration of their parents' marriage. Duke Eduard succeeded his brother in April 1918 and died five months later on September 13. His eldest surviving son, Joachim Ernst, 17, succeeded as Duke but reigned for only two months under the regency of his uncle, Prince Aribert, who abdicated for him in November 1918. She became pregnant almost immediately after the marriage, and on December 15, 1916, Marie Auguste gave birth to the couple's only child, a son, who was given the names Karl Franz Joseph. Prince Joachim shot himself with a revolver at his home, Villa Liegnitz, and was found by his servant, who summoned Joachim's brother, Eitel Friedrich. Prince Joachim was taken to St. Joseph's Hospital, where he died later that day. Prince Eitel Friedrich took custody of Joachim's three-year-old son. Prince Eitel Friedrich tried to obtain official custody of his nephew, claiming in court that Marie Auguste was "not a fit person" and had run away from her husband and son. 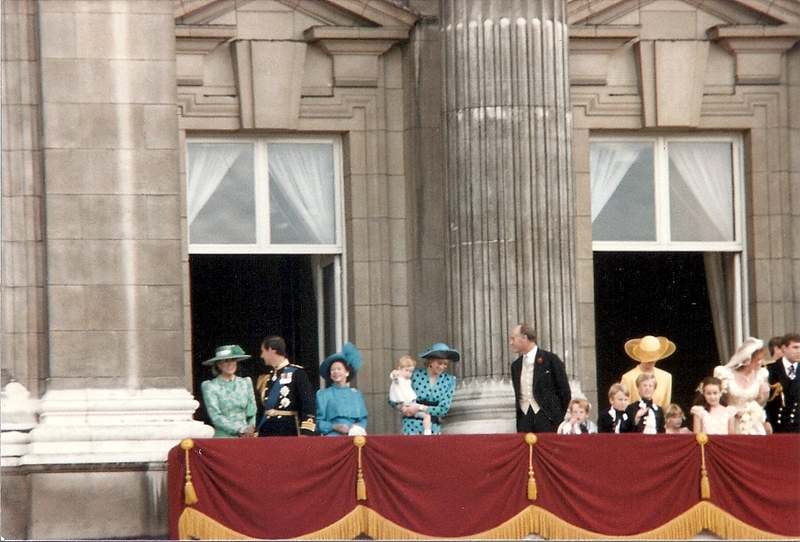 He also alluded to the court that the Princess was "not alone." Marie Auguste, who was still styled as Princess Joachim, came into court and "made her plea." She said she was "heartbroken and nerve-shattered." The court ruled that the Hohenzollern family laws were no longer valid, and the young prince must be returned to his mother. Prince Eitel Friedrich said that he would not appeal the decision. In 1924, Princess Marie Auguste became engaged to a Major Bienert, a wealthy Saxon mill owner, but on the eve of the wedding, the princess broke off the engagement, and went "into hiding." Three years later, on September 27, 1926, Princess Marie Auguste married a childhood friend, Baron Johannes Michael von Loën. This marriage ended in divorce nine years later. Princess Marie Auguste resumed her maiden name after her divorce. She lived quietly with limited means. Her only son, Prince Karl Franz Joseph, was married three times. His first wife, Princess Henriette of Schonaich-Carolath, the daughter of Kaiser Wilhelm's second wife, Hermine. The couple married in 1940 and were divorced in 1946. They had three sons, Franz Wilhelm, Friedrich Christian and Franz Friedrich. Franz Wilhelm and Friedrich Christian were twins, although Friedrich Christian died several weeks after the birth. Prince Karl Franz married two more times to Luise Hartmann (the marriage ended in divorce) and Eva Maria Herrera, a Peruvian, with whom he had two daughters, Alexandra and Desiree. Marie Auguste, who was in financial straits in the final years of her life, adopted several adults in exchange for money. The most famous of these adoptions took place in 1980 when she adopted Hans-Robert Lichtenberg. This was a business transaction arranged by Hans Hermann Weyer, who sold phony titles and university degrees. Since 1919, German titles have been a part of one's surname, so Lichtenberg became known as Friedrich Prinz von Anhalt, but not Prince Friedrich von Anhalt. Princess Marie Auguste of Anhalt died at Essen on May 22, 1983. Marie Auguste ceased to be a member of the Prussian family when Joachim died. After all, she had bolted (and for good reason), but it is unlikely that she received an allowance from the Kaiser. She remarried as well. Her own fortune was largely dissolved by the end of the war and her brother's abdication. It only became worse after the second world war because Anhalt is in the Eastern part of Germany. I am not sure how many members of the Prussian royal family received appanages. Certainly the main branch, but Georg Friedrich ended the appanages for his uncles, Cecilie received an allowance from her brother when she lived in the USA, after her husband had died. Princess Louise, who died last year, also received a small allowance until her death. Joachim's grandsons apparently did not. I have some interesting photos of Marie Auguste while she lived in a camper immediately after the Second World War. Apparently she was a painter of some talent and survived by selling her work. Marlene...what is the source of this piece? articles in the NY Times, WX Times, Los Angeles Times, London Times. Marlene, I assume that the Prince Aribert you mentioned is the same man who married Princess Marie Louise of Schleswig-Holstein, daughter of Princess Helena. Yes, Aribert was Marie Auguste's uncle. Fascinating story. I am curious about the jewels, if they were completely broken up or if they are intact and gracing the neck and hair of some royal or noble lady today. 20,000 seems astonishing amount of money by the standards of the day! No idea about the jewels. Perhaps the family got them back. Thank you for posting this piece. I enjoy learning more about the German royals as individuals. Perhaps you could post an article about the unorthadox marriage of the Kaisers other son, Prince Oscar? And how he was able to get away with it? Robert Lichtenberg was adopted by Marie Auguste (for money) which allows him to have the surname Prinz von Anhalt. It does not make him a prince. Queen Victoria of Sweden "critically ill"
who will King Edward marry? Carol says he gave up throne for "own soul"